The first cookbook in Spanish was printed in Toledo in the year 1525. 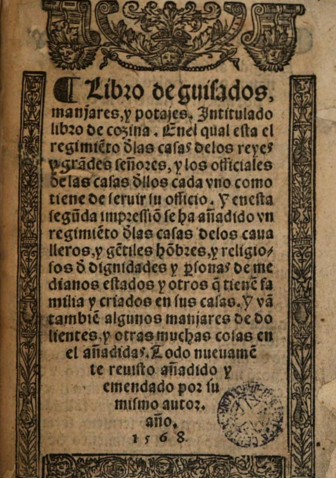 This is the translation of the Catalan Llibre del coch (Book of the cook) of the Chef, major cook, Ruperto de Nola, published in Barcelona in 1520. In Castile, this handbook and recipe book circulated from the sixteenth century as a book of stews … and cookbook in more than 15 editions. Here we share the link of the Cesarean edition of 1568 and the PDF of the princeps toledana. Little is known of the Master Ruperto: we only know that he served for the King Ferrante in the Court of Aragon in Naples, approximately in 1480, and that his handbook was published in Barcelona decades later. We do not know if he was born in Nola of Italy or in Noia of Barcelona, but ​​we do know that this book defined the taste of the modern courts and that, over time, these recipes invaded popular cooking. This book is in the main American libraries and we still do not know to what extent their recipes shaped the first mestizo foods. Since the recipes included in the work of Nola (as in the later Spanish ones of the seventeenth century) belonged to the palace area (we must understand the processes of adaptation). The use of spices determined, for example, the economic power of the court. Thus, the recipes for Naples were later adapted to the Castile and, even more, to the American soil (where this volume appears in both lists of booksellers and ecclesiastical libraries). Fundación y grandezas de la muy noble y muy leal ciudad de los Reyes de Lima, Rodrigo de Valdés S.J.